The Bonavita BV1800 8-Cup Coffee Maker is the perfect coffee maker for people who always find themselves in a hurry come morning time. Coffee makes us productive, so why not use a productive coffee maker? The Bonavita BV1800 has a very fast brew time and brews a delicious pot of coffee by ensuring that the temperature of the water is ideal. The Bonavita BV1800 is the ideal coffeemaker for anyone who really values the appropriate temperature of their coffee. The Bonavita BV1800 makes a perfect cup of coffee and does so by paying attention to details, if you enjoy drinking fine quality home brewed coffee, keep reading! The Bonavita BV1800 is a SCAA Certified coffee maker which implies that it is capable of brewing coffee that lives up to the standards set by the Specialty Coffee Association of America. The 1400-watt heater featured in the Bonavita BV1800 is part of the reason the coffee it brews is so good. This water heater quickly raises the temperature of the water till the optimum brewing temperature 200-205 degrees Fahrenheit. Moreover, it also uses a shower head system which allows complete saturation of the coffee grind. By completely saturating the coffee, the majority of the taste is transferred into the brew from the entire blend of coffee being used. Although the process follows perfection, the Bonavita BV1800 is still one of the fastest brewing machines available. With a brew time of only 5-6 minutes, it is the perfect machine for people with little time in the morning. The carafe itself featured in the Bonavita BV1800 is also designed in such a way to improve your coffee experience. The carafe is made of stainless steel and is lined with glass which provides better heat control. The convenient trigger lid also makes pouring easy, even with one hand. 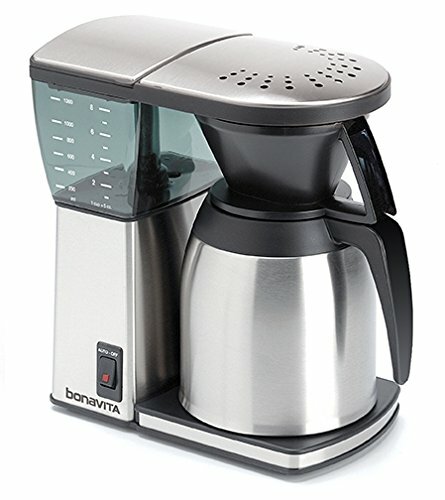 Obviously the Bonavita BV1800 features regular functions you have come to expect from coffee makers including: a heater plate to keep your coffee warm, easy to fill water tank, easy to clean filter basket, and a 2 hour auto shut off button. The Bonavita BV1800 produces high quality coffee and does so in record time which is one of the main reasons i can highly recommend it to any coffee drinker. Coffee is to get is going in the morning, no point if you have to wait forever to get your cup. Additionally, the Bonavita BV1800 offers 2 years warranty which reduces risk.